The Hager Group may not be a household name but this Franco-German company has been a force at the interface between electrical appliances and the built environment they're plugged into ever since 1955. It now employs over 11,000 across the globe, and one of their core sites is a light industrial complex in the French Rhineland town of Obernai. There, Hager decided to showcase their history, products and vision. A 2012 design competition to accommodate this was won by Berlin-based architects Sauerbruch Hutton. The practise has a thoughtful, rationalist reputation - partner Juan Lucas Young partner says plainly: 'we are modernists'. Their imaginative facades are well known, from the multicoloured arc of the GSW Head Office in Berlin (1999), a key project in re-uniting the city fabric after the fall of the Wall, to the timber cladding of the Immanuel Church in Cologne, winner of the 2015 Deutsche Architekturpreis (German Architecture Prize). 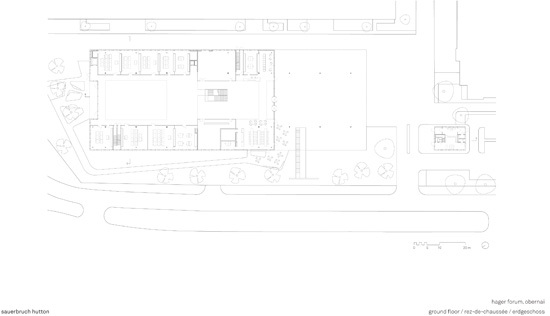 The new building, the Hager Forum, is long and low, a two storey structure with a rectangular footprint 108m by 39m. Its defining element is a continuous timber roof structure covering the whole site, with a 3m square coffer grid in which alternate rows are skylights. The first big surprise is how much of its length floats above the entrance as a canopy. It may echo the tectonics of a petrol station canopy, but its reach and height gives a sense of arriving somewhere significant - a full 38m thrusts out from the front glass facade, supported by six slender columns. This creates a covered plaza-like space that invites building occupants to step out and hang around. It's shady yet light is falling through it. Over the two-storey enclosed volume of the building, the roof has another 12 supports, and the grid alternates strips of skylight with photovoltaics. Facades are of aluminium panels and windows articulated on a 1.5m grid. Its repeating pattern of transparent, reflective, diffuse or solid-surfaced rectangles create an un-monotonous, clean and light effect. 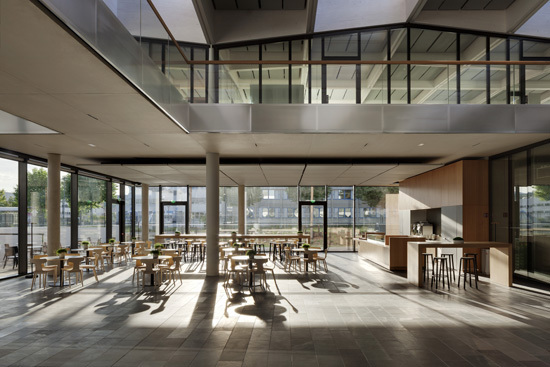 The Spark Café is inside, just beside the entrance, on the edge of a wide, airy space which runs the length of the building between glass-fronted rooms either side. Central stairs are all that break its expanse of hard grauwacke stone floor. One flight cuts into it, descending to the basement, and the other climbs to a wide 21m-span bridge (co-engineered with Werner Sobek) that gives the first floor an H-plan, and effectively divides the axial space into two atria. The building is functionally stratified - upstairs is the creative department, while the ground floor has exhibition spaces, including the Residential Lab showroom, where shutters can block outside light to enable projection right across a wall. Exhibition design is by Milla & Partner, and the aesthetic shifts from control-room calm in the Commercial Lab (all that's missing are boffins in white coats) to almost Pharmacy-period Damien Hirst in the exhibit of Hager's wall fixture interfaces, presented isolated and dispassionate in a wide glass vitrine. With future product on the drawing board upstairs and present capabilities on show at ground level, then of course, the basement is about the past. There, perhaps, is the greatest surprise of the Forum: the Force Field Showroom. Here, a corporate history film is screened, but in a setting that looks like it came from the 1982 film Tron. 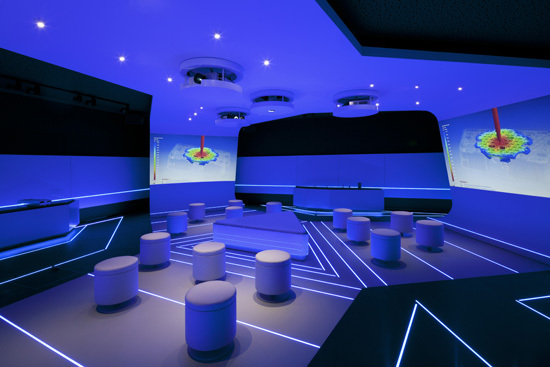 Parallel lines of blue light embedded in the floor define triangles and mark zones within the hexagonal space, walls become screens, and surfaces seem to glow a fluorescent deep blue bordering on purple. It may be modestly sized, but it feels like an almost cyberpunk virtual world. There's a smaller echo of the Forum in the new gateway security building opposite its entrance. Its canopy is cantilevered from a modest two-storey volume with the same cladding as its big brother. With its photovoltaics, stone floor thermal massing and air-conditioning-free internal climate, the Hager Forum is environmentally efficient, but it's not being certified- Young says flatly that the ratings are 'not understood by people'. It's also an intelligent building, running on a KNX-standard building management system. 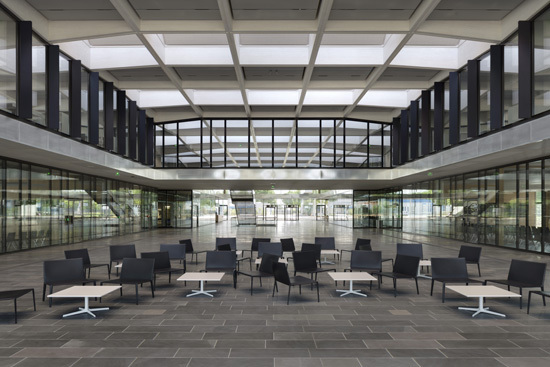 Overall, Sauerbruch Hutton has delivered a highly legible volume, full of space and light, to serve the electricals company. And into it, Milla & Partner have slipped some quietly surprising electricity.